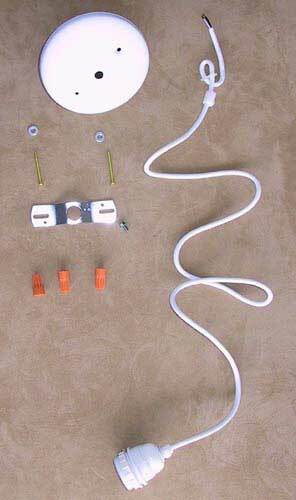 Ceiling electrical hardwire kit can be used for hanging paper lanterns or lamp shades. Hardwire cord kit includes single socket threaded with ring, 4ft cord, 5" diameter Canopy(White) and complete hardware kit.60-watt maximum. UL listed. Available in White ,black or chrome canopy.